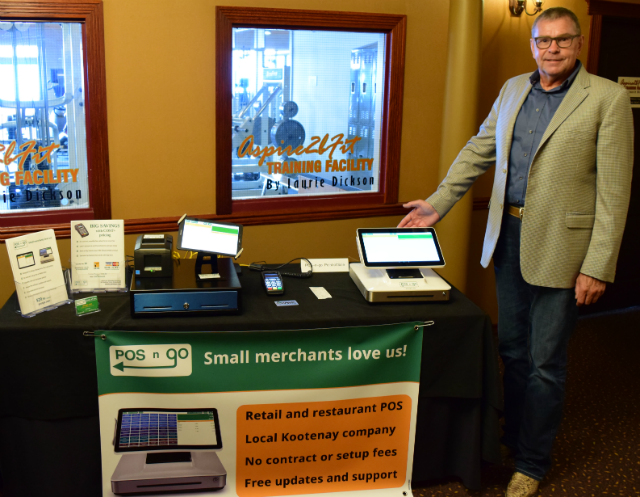 POS-n-go celebrates Small Business Week with the Cranbrook Chamber of Commerce. VP Sales and Marketing, Nowell Berg, shows off the Elo PayPoint all-in-one point of sale system. PayPoint includes a large touch screen, cash drawer, bar code scanner, receipt printer and a built-in customer facing LCD display. Local business owners stopped by to learn about POS-n-go and take a look at a demo on the PayPoint. Many were wowed by the PayPoint's sleek design and ease of installation. For merchants not able to attend the show and who want to learn more about our world-class POS, please contact Nowell either toll free 1-888-342-8882 #851, or email, nowell@posngo.com. Detailed information on POS-n-go features and pricing can be found at posngo.com.